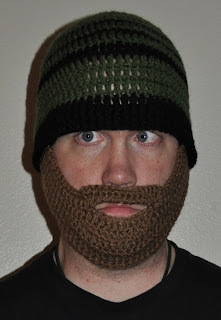 Another beard beanie!!! What could be better? Yea, I know, but I love him anyway. My husband's head is, how can I put this...larger-than-average. 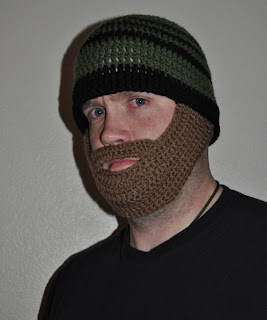 Because of this, I had to make him a custom fit beanie & beard. I think it turned out ok! For the ribbing around the base of the beanie, I did front-post double crochet stitches. 3-5 rounds will probably get the look you want. The cool thing about ending the beanie this way is you have vertical ribbing on the front and horizontal ribbing on the back. The horizontal ribbing on the inside of the beanie will actually help keep the beanie in place. For striping, I just winged it. There are two thin stripes, one medium, and then the larger band at the bottom (the front-post dc). The beard is a modified version of Jen Spears' that I have previously linked reference to. I had to change it a bit, but it's the same concept. To attach the beard, I just sewed the beard to the first row of ribbing on the inside of the beanie. It ends with a clean finish and the seam is hidden by the edge of the beanie. I'm having problems knowing where to place (sew) the beard on the beanie without it being too loose/ tight, do you have any suggestions? The best way is to put on the beanie and hold the beard to your face (or the person your making it for) however snug you want it to fit. Then, mark that place using stitch markers. I attached one side, then rechecked it by putting it on again. Faces can vary significantly (my husband's face specifically), but usually you can find an average that fits most people. Try having multiple people try it on. I hope this helps! I would love to see the finished product if you send them to me. Good luck! **I meant if you send pictures of the finished product.